The Royal Mint has today (4 April) announced that it will strike a limited number of silver coins from the bullion cargo of the SS Gairsoppa – more than 70 years after the silver carried on-board was destined to be delivered through The Royal Mint’s doors to boost its silver stocks during the Second World War. In a move likely to capture the imagination of anyone partial to tales of shipwrecks, SS Gairsoppa Britannia Quarter-Ounce Silver Coins are now available direct from The Royal Mint. This is the first time that coins have been created from the shipment of silver bullion – which has spent more than 70 years under the sea – outside of the United States, and there is a limited run of just 20,000. The story began in December 1940, when The Royal Mint, already depleted of its stocks of silver due to the onset of war in 1939, called in additional supplies from India. A large shipment was despatched aboard a British steam merchant ship, the SS Gairsoppa, which was also carrying shipments of pig iron and tea. She sailed under the protection of a series of naval convoys heading for Britain. Battling a heavy storm, and running short of coal off the coast of Southern Ireland, SS Gairsoppa’s crew had no option other than to break free from the protection of their convoy and head for the safety of Galway Harbour. Now an easy target, the unfortunate vessel was spotted and torpedoed by a German U-boat at 8 minutes past midnight on 17 February 1941. The stricken ship sunk within 20 minutes, with second officer R. H. Ayres the only survivor in spite of heroic attempts to save his fellow crew members. Concerned correspondence between The Royal Mint and the Bank of England at the time reveals the impact the loss had on the country’s wartime reserves, even threatening the temporary suspension of production of the 1,000 year-old Mint within two months if supplies ran out. 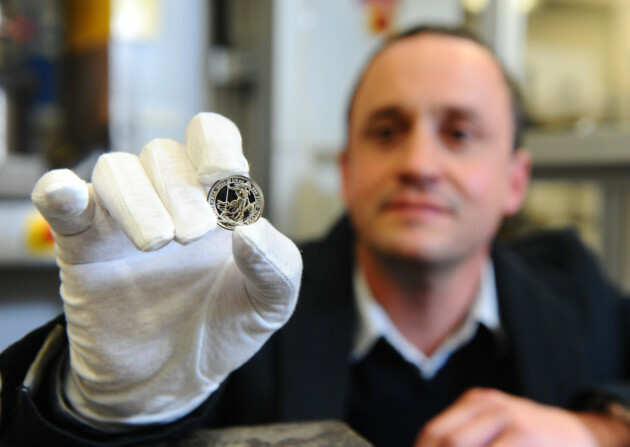 The ship was finally located in September 2011, 300 miles off the Irish coast at a depth of three miles, half a mile deeper than the Titanic, making this the largest and deepest recovery of precious metal from a shipwreck in history. Now, after 70 years, marine exploration company Odyssey Marine Exploration has recovered silver from the SS Gairsoppa, some of which has now been passed to The Royal Mint for the striking of the 99.9 pure 1/4oz silver Britannia bullion coins, which are edged with the name SS Gairsoppa. By pre-ordering from The Royal Mint website, customers can secure their own piece of history from this moving wartime story, along with a DVD featuring Silver Rush, the three-episode TV series aired by the Discovery Channel documenting the recovery of the sunken hoard. Shipping of the coins is likely to start from 21 April.